In this issue of Paranormal Underground magazine, we spotlight Andy Evans and his investigations of the Black Monk of Pontefract haunting; Dead Science Investigations’ Amanda Foskett, and paranormal author Joseph Nassise. We also profile The Bennington Triangle; men in black encounters; and the legend of Wendigo. Plus, we discuss classifications of ghosts, spirits, and other entities; how to manifest mindfulness, and the importance of mentors. And don’t miss our features about the third eye, Victorian mourning rituals, and personal paranormal experiences, including a Resurrection Mary sighting. We also present articles on ethics in the paranormal world, dream interpretation, reincarnation, and more. 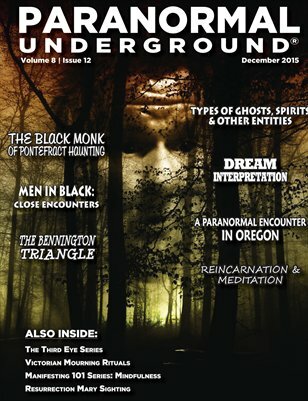 For a PDF download or 12-month digital (email) subscription to Paranormal Underground magazine, visit www.paranormalunderground.net!